Our gallery has been updated with posters, production stills, Blu-Ray quality screen captures and much more of “Avengers: Age of Ultron”, “I Saw the Light” and “Captain America: Civil War”. The first production stills from Lizzie’s upcoming movies “Ingrid Goes West” and “Wind River” have also been added to our gallery. The Captain America: Civil War cast just got bigger! 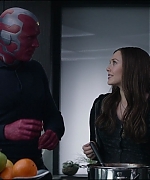 During a Meet the Filmmakers event at the Regent Street Apple Store in London Wednesday, Elizabeth Olsen was asked if she will reprise her Avengers: Age of Ultron role of Wanda Maximoff/Scarlet Witch in the Marvel Studios movie. “I guess I’m allowed to talk about that now,” the actress said. Olsen didn’t divulge further details, other than that she’ll film her scenes in Atlanta in two weeks. Marvel Studios has yet to officially confirm Olsen’s involvement. The actress joins many Marvel Universe veterans, including Robert Downey Jr. (Tony Stark/Iron Man), Chris Evans (Steve Rogers/Captain America), Frank Grillo (Brock Rumlow/Crossbones), Samuel L. Jackson (Nick Fury), Scarlett Johansson (Natasha Romanoff/Black Widow), Anthony Mackie (Sam Wilson/Falcon) Jeremy Renner (Clint Barton/Hawkeye) and Sebastian Stan (Bucky Barnes/The Winter Soldier). Additionally, Chadwick Boseman will make his debut as T’Challa/Black Panther and Daniel Brühl will play a villain. 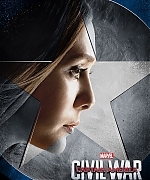 It was in Captain America: The Winter Soldier’s post-credits scene that Olsen made her debut in the Marvel Universe (along with Aaron Taylor-Johnson, who plays her twin brother Pietro Maximoff/Quicksilver). 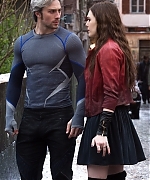 Olsen and Taylor-Johnson’s characters will get more screen time in Avengers: Age of Ultron, in theaters May 1.